The Carnatic Vocal Arangetram of Sakthi Ravitharan was introduced as “the most senior student” presented by Srimathi Shobha Sekhar. One expected a mature young lady to ascend the stage. Instead a young, captivating, hardly fifteen year old was confidently composing herself on stage to start her performance. Four and one half to fifteen is hardly enough time to achieve a good standard in Carnatic music exposition. So it was a sceptic audience that awaited the outcome. However Sakthi’s powerful scintillating voice and her exceptional motivation and innocent confidence propelled her to start with the popular Ata thala varnam in Kaanada and set the atmosphere for a high class recital. She followed it up with two Apoorva raga keerthanams that spurred the interest of all music lovers. Sakthi rendered the ensuing Raga alapana and the krithis with confidence and her resonating captivating voice filled the hall with melodious aplomb. It confirmed the fact that the audience could look forward to a recital of standard. The rendering of Kambhoji ragam was worthy of mention, but the rendering of the popular “O Rangasayi” was done in haste not allowing time for the appreciation it deserved. However, there was a clear touch of D K Pattamal’s style in it. 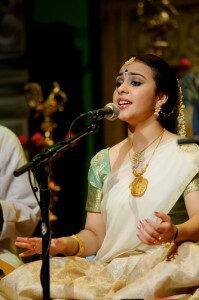 Maybe Sakthi does idolize popular young musicians too and her kelvignanam allows her to pick up many of their styles. Sakthi was able to achieve a melodious rendering of each ragam and keerthanam so well taught by her exemplary Guru. The efficiency and individuality of Sakthi’s Guru Shobha Sekhar was more than evident in her unique Pallavi composition in varied ragas and thalas that beautifully blend in. One could say that it would be rare to hear a composition of this calibre. Besides, guiding such a young student to confidently and flawlessly reproduce it is certainly a great achievement. Sakthi’s manodharma exposition displayed in the effortless rendering of the ragas and swara korvais was noteworthy. Even when she sang “Aasai Mukam” she switched over to conveying the bhava content of the song. Every piece Sakthi sang was an improvement on the other. The culmination of all her efforts to keep up standards was the degree of manodharma she displayed with confidence and aplomb in the rendering of the ragas, the thanam and the unique Pallavi. Every sanchari in the melodious Shanmugapriya and the brighas she used were appropriately included suitable to the range in her resonant voice. All I would like Sakthi to remember is admire and follow popular young artists as well as the depth and valuable content of senior doyens of the art. Her individuality and creativity is what we need to see grow and shine in the future, which I am sure is not far off. The young violinist Embar Kannan was a colourful embellishment to a graceful and captivating melodious evening. 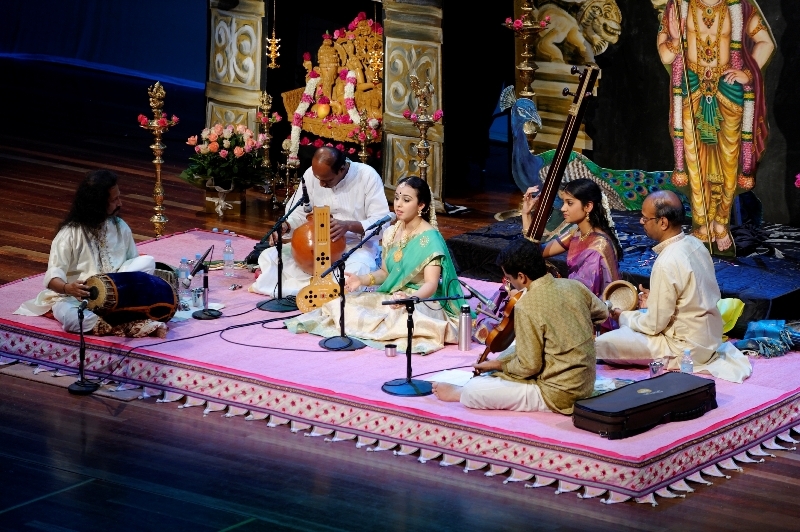 The mridhangist J Vaidhyanathan provided a supportive and guiding force to Sakthi’s rendering of the unique Pallavi true to his musical lineage. The ghatam artist S V Ramani and kanjira and flute artist R Thiagarajan were equally supportive and added colour through the whole repertoire. Many times we find the tambura player an ornamental addition. Fortunately this young lady Indika was visibly enjoying the natham (tone) of the tambura supporting Sakthi to sing with real sruthi suththam.